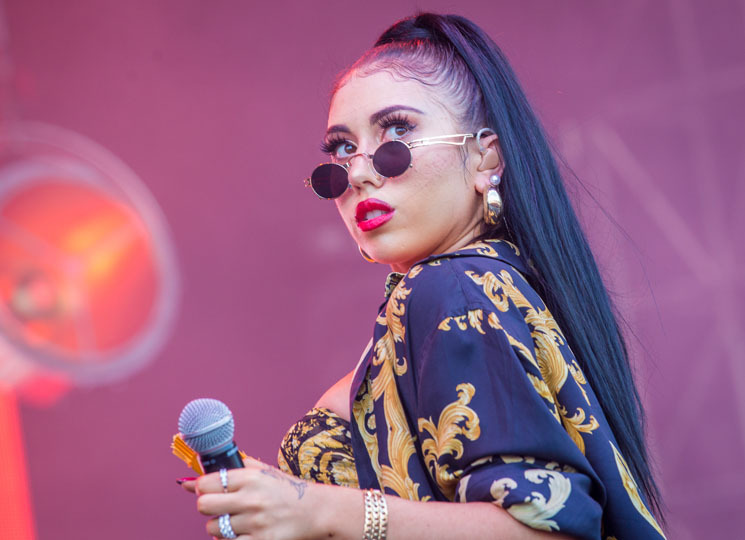 Kali Uchis is a woman who knows her power. Stepping onto the stage amid yesterday afternoon's heat wave wearing a matching bra and shorts combo, her long ponytail swinging behind her, she was the embodiment of Latina sensuality; the crowd screamed with every move of her hips. Touring in promotion of her critically acclaimed Isolation, Uchis uses her personal hardships and infuses them with reggaetón, funk and R&B, bringing private thoughts into a very danceable public space. Opening with "Dead to Me" and moving through "Rush" off 2015's Por Vida with an excellent backing band driving the beats, Uchis moved across the stage, throwing in the occasional twerk and salsa step. Moving through "Tyrant," "Feel Like a Fool" and "Loner," which opens with "I don't want to be your cigarette/I don't want to be your ashtray," she took a quick interlude to earnestly explain that these were, indeed, personal experiences and that she was thankful to the crowd for being with her on this journey. She continued on throughout her short, sweet set with more of her brilliantly produced tracks, hitting the majority of her notes and the crowd eating her up with a spoon. Watch Tyler, the Creator's New Video for "See You Again"